The City of Dallas is bracing for more heavy rain and flash flooding as Tropical Storm Bill moved ashore Tuesday. 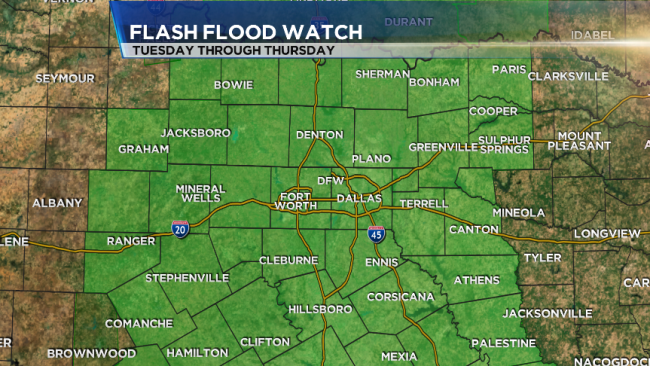 North Texas is under a Flash Flood Watch from 7 a.m. Tuesday through 7 p.m. Thursday in anticipation of the heavy rain. North Texas is under a Flash Flood Watch from 7 a.m. Tuesday to 7 p.m. Thursday as a tropical storm system brings heavy rainfall to areas still recovering from record May rain. The Dallas Emergency Operations Center opened at 6 a.m. Wednesday anticipating localized flooding. The National Weather Service told The City of Dallas to expect six to eight inches of rain starting Wednesday morning through Thursday morning. "In the last couple of days, we have looked at our plans, identified the low-lying areas that are flood-prone areas that we know, areas that flooded during the May 29 event," said Rocky Vaz with the City of Dallas Office of Emergency Management. Vaz said evacuation, evacuation routes and shelter plans are in place if they are needed. 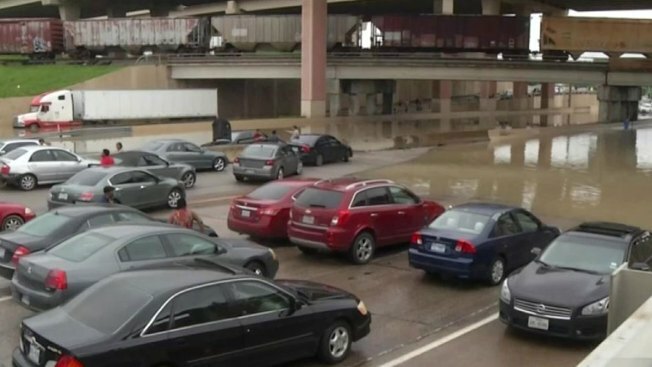 Dallas streets and highways closed by floodwaters over the Memorial Day weekend are expected to be closed again in anticipation of more heavy rain. Vaz said he expects current efforts underway to keep the Loop 12/Singleton area from flooding will be able to keep flooding at bay. Meanwhile the Elm Fork area around Stemmons Freeway and Northwest Highway is the focus. Vaz said depending on how much rain falls, and how much Lake Lewisville and Grapevine Lake release after the rain, the area could flood again. "The rain event itself is not as worrisome to us, as what happens two days after the rain ends, and how much water is coming from upstream and dams that need to release," said Vaz. "It's a very dangerous time for us because the creeks are full, the ground is saturated, the rivers are full, lakes are full," said Dallas County Judge Clay Jenkins. "There's nowhere for this water to go." City crews have pre-staged street barriers in anticipation of those closures. "I can't say enough how important it is to help us keep your family safe. Don't drive or play around this water," said Jenkins. Vaz said the Department of Street Services is running a 24/7 operation, and Flood Control division is also running 24/7 operation. North Texas lakes and rivers are down from their peaks after May's record rainfall, but with more rain on the way starting Tuesday, lakes are expected to reach the same high levels as last month. Even now, the U.S. Army Corps of Engineers continues to release water along the Trinity River system to allow lakes to accept more rainwater. "Part of flood control is you're always preparing for the next flood," said James Murphy, with the U.S. Army Corps of Engineers. "What we hope to do is to be able to contain the floodwaters in the flood control reservoirs to reduce that impact downstream." Storm-related calls are already picking up inside Dallas' 3-1-1 call center. "If it's anything like our past experience, we have had a lot of call volume right after the storm or during the storm," said Cheryl Jones, operations manager for Dallas 3-1-1. Extra staff are being called in to handle the expected flood of weather related calls. "If you need police, fire or emergency medical, call 9-1-1," said assistant director Margaret Wright. "Everything else, you can call us. High water, traffic signals out, traffic lights flashing, you can call 3-1-1." Storm-related calls are already picking up inside Dallas’ 3-1-1 call center ahead of the arrival of Tropical Storm Bill. Both University Park and Dallas use the 3-1-1 system, but many other cities have similar non-emergency numbers for city services. "If there's high water in the streets, we make sure we send our guys to put out barricades, cones or whatever they need to do," said Dallas 3-1-1 dispatcher Abel Castro. NBC 5's Kevin Cokely contributed to this report.